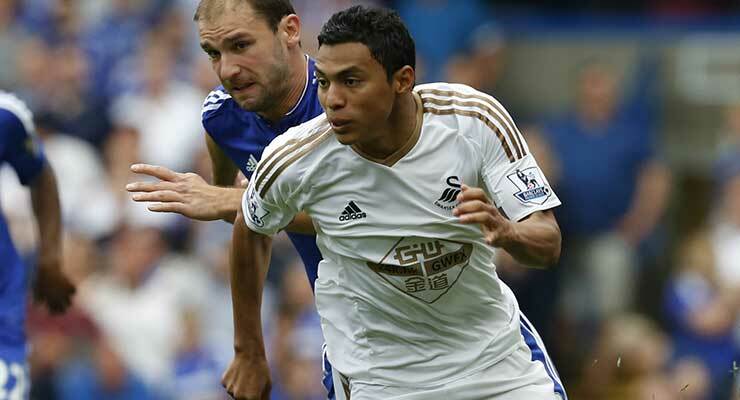 After several mentions on social media yesterday about Jefferson Montero heading back to his homeland, Swansea City have today officially confirmed that Montero has now gone out on a sub-loan to his former club Emelec. The winger had originally moved to Spanish La Liga side Getafe in September on loan but will complete his season long loan back in his homeland. Some Swans fans will of course remember that the speedster had previously played in Spain. It has now been nearly seven years since Real Zaragoza beat Levante 2-1 away from home to avoid relegation to the second tier of Spanish football – a match that sparked a match-fixing scandal that is still being investigated today. Swansea City winger Montero was one of more than 40 players and staff implicated in the case, in which it is alleged that over €1m was paid to Levante players to throw the game at the Estadio Ciutat de Valencia. Other players at risk of prosecution include Manchester United midfielder Ander Herrera, Leicester City’s Vicente Iborra, Felipe Caicedo of Lazio, Christian Stuani of Girona and Atletico Madrid’s Gabi. The Swans’ former SCFC2 Player of the Month was on loan at Levante from Villarreal when the alleged incident occurred. He is currently employed by Swansea City but is spending the season on loan at Spanish club Getafe after falling out of favour with former boss Paul Clement last season. The case was reopened this year after a two-year delay and is likely to result in many high-profile names being brought to trial at the Spanish courts. Investigations into the paper trail at the time has shown that the tax expense claims for several Levante players in the year of the incident were suspiciously low, with some dropping from more than €200,000 the year before to minimal amounts or even zero in 2011. Other documents showed that ten people involved in the game received and then withdrew large cash sums from their bank accounts which were subsequently handed to the club president Agapito Iglesias for undisclosed reasons. The prosecutors claim that this money ended up in the hands of Levante players, who in return lost the match. While two-year prison sentences are being sought for those who may be found guilty, first-time offenders in Spain who are handed sentences of two years or less do not go to prison. Perhaps more damaging to some could be the six-year soccer bans that the prosecutors are also pursuing for those involved. Great escape or act of corruption? The 2010/11 relegation battle was one of the tightest in La Liga memory with just six points separating eighth-ranked Osasuna and 18th Deportivo La Coruña on the final day. Zaragoza’s win against Levante lifted the club out of the bottom three into 13th place, sending Depor down to the second tier. Amazingly, the club from Aragon performed a similar feat the following year, winning at Getafe on the final day of the campaign to lift themselves out of the bottom three where they had languished since November. However, that match never came under scrutiny. The case first came to light when representatives from the relegated Galician club raised the issue with La Liga President Javier Tebas. The claims were denounced by Tebas, prompting anti-corruption Prosecutor, Alejandro Luzon, to take charge of the case. Following interrogations in 2014, the case was passed to the courts in Valencia. In 2015, Atletico Madrid Captain Gabi admitted that envelopes filled with cash had been handed to club chief Agapito. However, a year later, several other key witnesses dropped out of the case leaving Depor battling alone against Tebas. Following the referee’s testimony that no suspicious activity took place during the game, the judge in Valencia shelved the case due to lack of progress or fresh evidence. But that was not the end of the matter. Tax investigations during this spell threw up several irregularities in players’ expenses claims and the prosecutor’s office insisted that it would be a betrayal of the sport’s penal code if the case was not brought to trial. As a result, the case was reopened and the evidence is now being reviewed. Real Zaragoza were eventually relegated just two years after the incident and have remained in the second tier ever since, their longest spell out of the top flight since 1951. Of course, this is not the first case of suspected match-fixing in Europe and it is unlikely to be the last. And those looking to engineer results for financial gain will naturally target those best placed to influence the game such as players and match officials. In 1962, a group of English players including Jimmy Gauld and David Layne colluded to ensure that Sheffield Wednesday would to lose their match against Ipswich Town on December 1. They then placed bets accordingly and profited from the result. The plan was a success and the syndicate continued their operation and over the next two years drafting in several more players. However, the scam was short-lived as Sunday People journalist Michael Gabbert was alerted to the illegal activities and set about uncovering the scandal. Gauld eventually sold his story to the same paper that exposed him, resulting in a trial that saw 10 players sent to prison including Everton player and former England International Tony Kay. Another 23 players were prosecuted on related charges. Seven of the players received life bans, four of which were later overturned on appeal. Kay continued his criminal career and eventually spent 12 years on the run after committing diamond fraud. It is estimated that illegal betting is now a £306 billion industry and has resulted in close to 400 European football matches being fixed. Of the many match-fixing scandals to have blighted the game in Europe, perhaps the most famous of all happened in Italy in 2006. The Calciopoli scandal stunned the football world and caused major damage to the image and credibility of Italian football. The most shocking aspect of the scandal was the amount of high-profile teams that were involved and the sheer depth of the corruption. A network of Individuals at famous clubs such as Juventus, AC Milan, Lazio, Fiorentina and Reggina were all implicated in attempting to influence the results of football matches for the benefit of the clubs involved. The scheme involved Coaches, club officials and referees, and the investigation led to punishments for five teams and 19 individuals. Turin side Juventus, were eventually relegated to Serie B, deducted 9 points, stripped of their 2005 and 2006 Serie A titles and banned from competing in the 2006-2007 UEFA Champions League. Other punishments included point deductions for Reggina, Fiorentina, Milan and Lazio. For Juventus, it was the first-ever relegation in their history and prompted an exodus of high-profile players, including Zlatan Ibrahimovic, Lillian Thuram and Fabio Cannavaro. The investigations cast a shadow over Italian football during the build-up to the 2006 World Cup Final in Germany but despite the controversy, Italy managed to win the tournament. The victory brought great relief for many players who had been affected by but were not involved in the scandal. The current case is not the first match-fixing scandal to have rocked Spain. In 1997, under the pressure of blackmail, officials from Belgium club Anderlecht admitted that they had handed money to Spanish referee Emilio Carlos Guruceta to influence the outcome of their UEFA Cup semi-final second leg against Nottingham Forest back in 1984. A dubious penalty and incorrectly disallowed goal ensured that the Belgian side went through at the English club’s expense. But despite these revelations, the award given to the best referee in Spain each season, still bears the name of Guruceta.